This is such a cute and funny book! 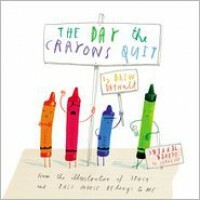 The Day the Crayons Quit is a story all about a bunch of crayons who write letters to their person, Duncan about how they hate how they are being used. Some crayons feel unappreciated compared to other colors, and other crayons are arguing with other crayons about how they should be used. It is all quite funny and ridiculous, so kids would love it. I would read this book to an older group of students, like 3rd or 4th graders. I could use this book to teach students how to write a letter. As an activity, students could write a letter to their favorite or least favorite crayon.